Rhoda D'Ettore was born in Woodbury, New Jersey, into a family of 5 siblings--which has provided her with plenty of comical material. She began working at the United States Postal Service at 25 years old, and over the past 15 years has accumulated many humorous stories about situations that the public never gets to know about. Her first ebook, "Goin' Postal: True Stories of a U.S. 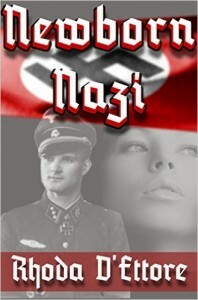 Postal Worker" was so popular that readers requested it in paperback. 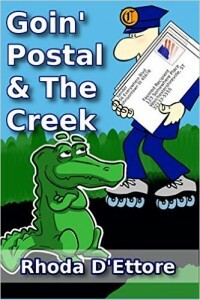 Recently, she published the humorous "Goin' Postal" in paperback along with another story entitled, "The Creek: Where Stories of the Past Come Alive". Combining these two into one book may seem strange, as one is humorous and the other is a heart wrenching historical fiction, however, doing so proves to the reader Rhoda D'Ettore's versatility. Rhoda D'Ettore received her degree in Human & Social Services while working at USPS, has travelled extensively, and loves history. Over the years she has volunteered for several community service organizations, including fostering abused and neglected dogs for a Dalmatian rescue. 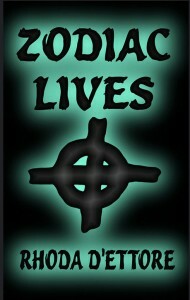 No One is Safe While...Zodiac Lives. After surviving a car accident that killed her father, three-year-old Jennifer begins having nightmares. It's soon obvious she suffers from something more dreadful than the accident when she provides clues to a murder committed 3,000 miles away - two decades before she was born. Jennifer's nightmares set off a chain reaction that prompts the infamous Zodiac Killer to emerge from dormancy and terrorize San Francisco for a second time. Zodiac, tell me a little about yourself. Where are you from? Is there anything you would like your fans to know about you that maybe wasn't revealed in your story? I'm much more complicated than people would assume, and I'm often conflicted. I like killing, killing is fun, but wasn't always. I grew up in Texas where it was easy to get weapons for my favorite pass time. 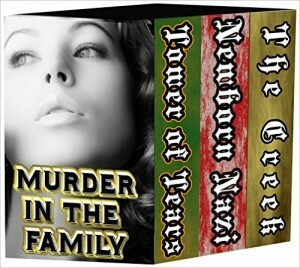 I grew up in Texas to one of the most dysfunctional families ever. My father taught me everything I know, and he did so with the best of intentions. Somehow he believed that instilling the skills of a serial killer would be helpful to a child. However, it probably wasn't his fault, as with abuse, it was a vicious cycle. Therefore, I come from a long line of killers. What makes you, the Zodiac, so special? First and foremost, I'm intelligent and witty. I created hundreds of codes and cyphers that even forty years later, the authorities failed to crack. How often in today's society does a serial killer go free? Most get caught. I never did, which makes me better than all the rest. Police, media, and whole cities fear me. It's awesome to know I have that power over millions of people. At anytime, I can write a letter to the police threatening to blow up a school bus or start a killing spree and people would lock themselves away in their homes. That is futile as I can find and kill anyone. No one is safe because Zodiac Lives. As you can imagine, choosing a career as a killer can wreak havoc on a relationship. There is always the sneaking around, hiding things, censoring my words around people. I'm never myself in public, and those who have seen the real me—well, they/re dead. We all have regrets. I do talk about mine in the book, so I won't delve here. I also wish I would have killed my father when the initial thought arose. Allowing him to live was a worst injustice to society (and me) than any of my crimes. I'm finally getting used to this internet thing. In five years, I imagine I will be using it to stalk my prey. People are so stupid. They tell you everything online. My father used to tell me that if I was on the run with the police chasing me, I should run for a house with toys and bikes in the yard. Kids always run in and out of the house so parents rarely lock the doors. Over the years, it seems more people will lock the front door of the home, but accept friends requests from anyone on line, then tell them a life story. I can use this to my advantage, so be careful. I never had kids. When I was younger I thought having children would be cruel. I'd either screw up the kid, or I'd get arrested and screw him up that way. Now that I'm older, I wonder if having children would have given me a reason to be a productive member of society. I might have put my skills to other uses, but we'll never know now. For the most part, I can take anyone I want anywhere now—I'm a serial killer, so kidnapping is no problem for me. But seriously, I would have Neil Armstrong take me to the moon. I'd make them figure out how to write the words “This is The Zodiac Speaking, I'm Alive” on the moon. I always liked batman, so using the moon as my “Zodiac Signal” would be really cool. I met a wonderful woman and fell in love. I wasn't expecting that. The FBI put me on their Most Wanted list. It melted my heart, truly. What was even better was that they didn't know my name. It really placed me well above the rest of the fugitives. I've already done this. Most people think Lee Harvey Oswald killed Kennedy, but that's a load of crap. There were three men who hunted JFK down like wild game. I found them, and made sure they paid the price. Yes, the torture went on for weeks in a basement. Let's just say that knives and medieval devices were used. 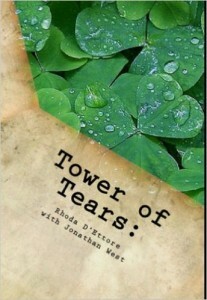 If interested, Rhoda D'Ettore depicts my skills of chopping, slicing, and dicing in the new book about me. Ugly and live forever. People don't take notice to ugly people, therefore I could go on killing and tormenting the police for all eternity. The one thing I have learned over the decades, technology might become more advanced, but the people running it are still stupid. They'd never catch me. Jack the Ripper. I'd want to ask him if we were truly related as my father always seemed to think. I'd probably ask him how he was able to balance our “occupation” with family life. If I am a descendant, then he must have had a family. Like I said earlier, I'm conflicted. Sometimes I want to retire to a tropical island, and other times I want to kill whole groups of people. I know in my head that killing is wrong, but sometimes I just don't care. How could I be embarrassed about myself? I'm the crème de la crème. Dahmer, Gacey, Bundy … they were great men, but they were all caught. Only I have been able to evade apprehension for decades. Even the BTK and the Green River Killer were caught after a couple decades, but I remain free. I think having a conscience, as little as it may be, is something of which I can be proud. It is one more way it sets me apart from the rest. Beach, definitely. I'm a psychopath, but I'm still a man who loves women in bikinis. Hillary Clinton. When she announced she was running for President of the United States, I thought about going after her. Even I'm not that sadistic to want her unleashed on America. Then I thought about it. With all the security, cameras, political aides, and media around her, it would be a huge expense of my time and effort. It could be done, but why bother? If she keeps running her mouth, she's create her own demise. I have read two of Rhoda’s books so far and can’t wait to start Zodiac. It has me intrigued. Definitely on my TBR list.